By the time the first people left Africa about 60,000 BC they already knew how to use boats, and some of them may have first arrived in West Asia by sailing from East Africa around the Arabian Peninsula and up the Persian Gulf. 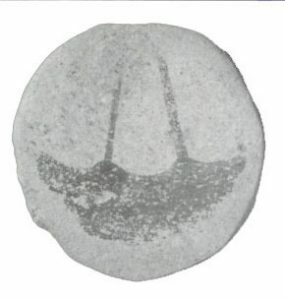 We know people were sailing in the Persian Gulf by 5000 BC, as you can see in the picture. 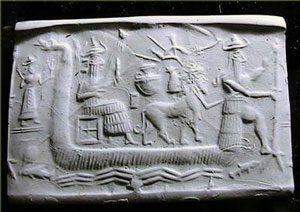 The Sumerians, in the 2000s BC, regularly sailed up and down the Tigris and Euphrates rivers in small boats with oars and simple masts and sails like the one on the ship from the Arabian Peninsula. This boat is made of bundles of reeds tied together, because wood was too expensive. About the same time, the Phoenicians were regularly sailing on the Mediterranean Sea to the islands of Cyprus and Crete, and along the coast south to Egypt. 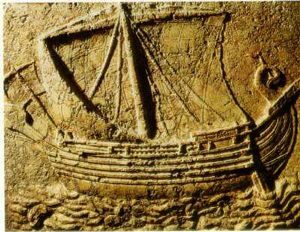 By 800 BC, the Phoenicians were sailing all over the Mediterranean, establishing colonies at Carthage and in Spain and Sicily. They reached the Atlantic Ocean and saw that the coastline of Africa turned south at the Straits of Gibraltar. Still they had only simple sails on one mast. 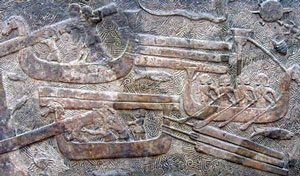 Soon after this, the Assyrians were sailing up and down the Euphrates river, getting logs from Phoenicia to build their palaces and temples. They didn’t build big ships to hold the wood. Instead, they used little boats like canoes, and dragged the logs behind the boats, in the water. These river boats don’t have sails. Rowers are using oars, but also, if they’re going back down the Euphrates towards the Persian Gulf, they can just let the current slowly carry them downstream. According to Herodotus, the Persian king Xerxes sent his cousin Sataspes to try to sail around Africa about 480 BC. Apparently Sataspes came back and said he went south until he came to a place where short people lived, who wore clothes made from palm leaves, but he couldn’t go any farther south because the ship wouldn’t sail any further. Possibly Sataspes ran into the strong northward current that still flows along the western coast of Africa. In 330 BC Alexander conquered the Eastern Mediterranean coast, and by the 100s BC the coast became part of the Roman Empire, and Phoenician sailors became Roman sailors. Cite this page: Carr, K.E. West Asian sailing – the Phoenicians. Quatr.us Study Guides, September 16, 2017. Web. April 21, 2019.